The Litter Legends Campaign is back!!! The Litter Legends Campaign Grants Program is back in 2018!!! Keep Australia beautiful is excited to announce that the Litter Legends Campaign will be back next year!!! 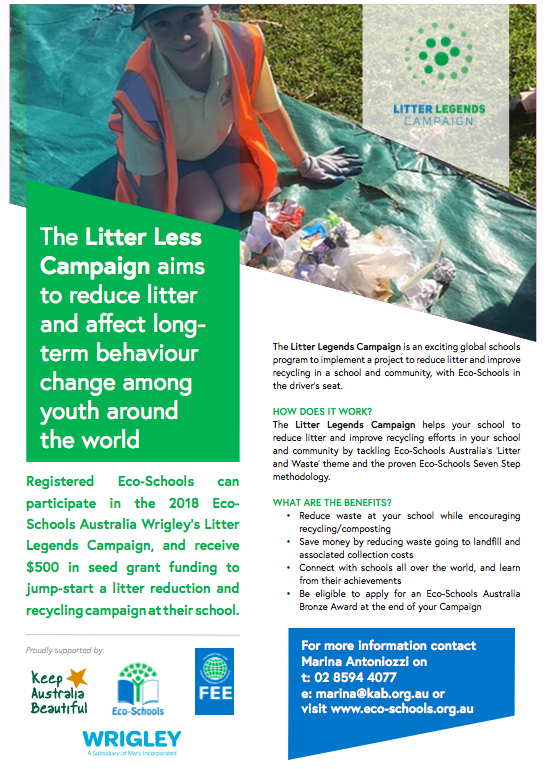 The Litter Legends Campaign is an exciting global schools project to implement a project to reduce litter and improve recycling in their school and community with Eco-Schools in the driver’s seat. The first 20 Australian Eco-Schools to apply can receive $500 (inc. GST) towards completing a Litter Legends Project. To be eligible to receive a grant, schools must be registered financial members of Eco-Schools. Eco-Schools that join this project will follow the Eco-Schools 7-step framework to carry out their campaign on litter, including monitoring litter, raising awareness of litter issues in the local community, and collaborating with others in their community and beyond. The completion of this project will lead your school a long way towards achieving your first level award, the Bronze Award for the theme of Litter & Waste: the Lifecycle of Stuff or can contribute towards a higher award if you are already at Bronze. This Litter Legends Campaign contributes to the International Litter Less Campaign funded by the Wrigley Company Foundation.